Rain, rain go away!! This spring we gave a sigh of relief and celebrated that our construction weather delays were behind us. Unfortunately, it has been a very wet spring and summer. Assisted Living has transformed in the last month. Our new addition has a second floor and the second-floor renovations to the dining room and sitting area a making good progress. We hope our new addition will be completed in early 2019. When this is complete our AL residents who live in older rooms will move to our new rooms while theirs are being renovated. Walls will be taken down to combine smaller apartments and allow the creation of private bathrooms. The renovated rooms will be unrecognizable when we are finished updating them! Everyone is AL is very gracious about the noise and mess. They are looking forward to the new dining areas and the new connector to Maple Terrace. In Independent Living, our new Bistro is underway and the roof is going on The Grove. Soon we will be able to put our windows in and focus on the interior. 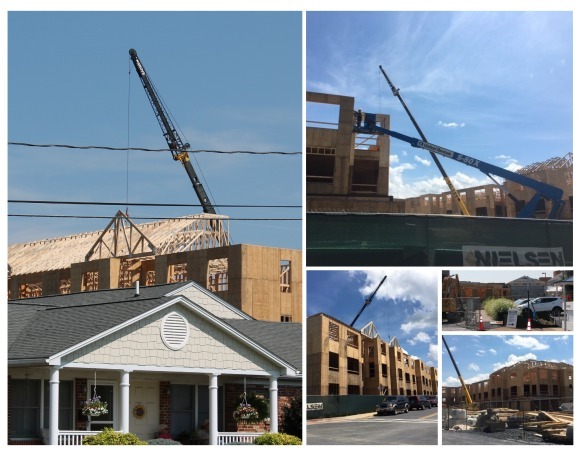 Our interest in The Grove continues to be strong and we only have 9 apartments left! In early 2019, we will have our model complete and will be holding open houses to let everyone see our new open floorplan and finishes. We are hoping for beautiful and DRY fall as we continue our construction. Sign up for our newsletter, so you don’t miss a thing!